1. I have treated other people better than I have treated my own spouse. 2. I have not always spoken about my spouse with love, and I have not always presented him in the best light. 3. I have been too angry to forgive my spouse. 4. Because of my anger, I have withheld love and I have been disrespectful. 5. My actions have been sinful against both my marriage and my family. You see, for years, I have been a contentious wife, and what the Bible has to say about this kind of wife is eye opening. Proverbs 25:24 says, “It is better to live on a corner of a roof than in a house shared with a contentious woman.” WOW! Living on a corner of a rooftop is better?!?! Now that is saying something. Well, today as I sat in church, the pastor mentioned the Apostle Paul, and just upon hearing Paul’s name, I began to think about Paul’s redemption from one of the most ardent persecutors of Christians to one of the most devout lovers of Christ. I then began to think that if Christ could convert Paul, then He can also change me, and what’s more, He can change my husband as well. So for the next 30 days, my focus is not going to be on who is right or wrong, but on being less contentious and reviving my marriage. I plan to show love and have fun with my husband, and I challenge you (if this post relates to you at all or if you want to make sure you don’t become a contentious woman) to do the same. So here are two great challenges: choose the one that works for you or choose both! Popsugar promises to spice up anyone who is in a “relationship rut”! 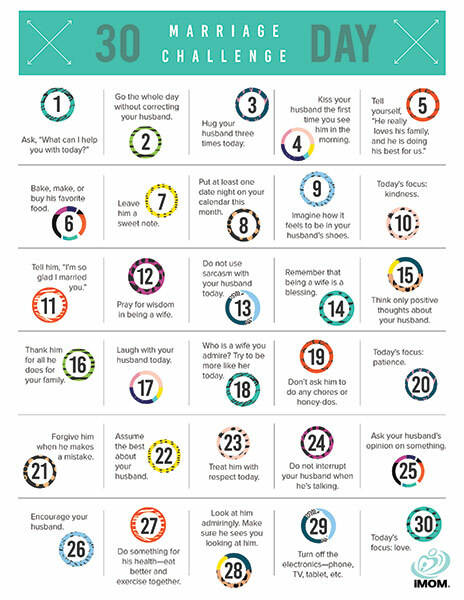 Have a loving 30 days; you and your spouse deserve it!